Flake tuna in a medium bowl; add corn and mayonnaise. Spread half of each lavash with the avocado, season with salt and pepper. 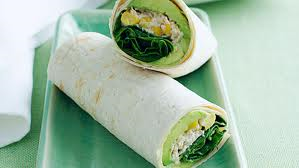 Spread tuna mixture over avocado, then top with spinach. Roll up tightly to enclose. Wrap in greaseproof paper or plastic wrap.